Last week I had my post-partum follow-up visit in Soho. I got the green light to jog and have gone a few times already (where’s the snail emoji?). Dave came with me and then to brunch at Balthazar (with Vivian in tow of course). Next we hit up one of our favorite NY bookstores, McNally Jackson Books. I am completely guilty of judging books by their cover and wandered around the store picking up covers that called to me. I am obsessed with this one designed by Peter Mendelsund whose site I immediately poured over to much amazement. Other covers I love at the moment include: The Vacationers by my friend Emma Straub, Lena Dunham’s Not That Kind of Girl (I’m half way through), and this gem, Worn Stories. 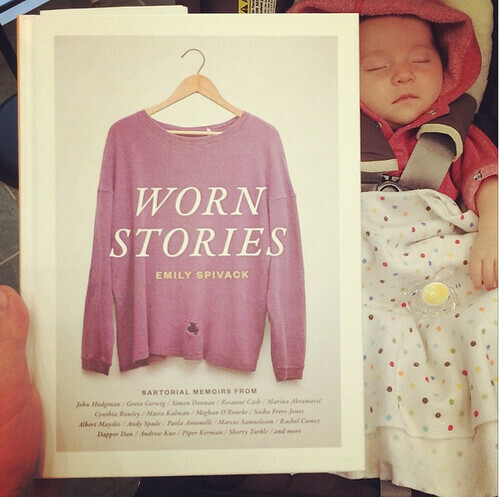 Initially I picked up Worn Stories for aesthetic reasons but then began to read a few of the essays standing right there in the shop, blocking the aisle with Viv’s stroller. I started with Andy Spade, Simon Doonan, and Rachel Comey and realized that the book is so much less about sartorial things and so much more about the meaning and history we imbue objects with and how they compel us to convey our own stories. I had to buy the book of course and since have read most of the essays. My absolute favorite ones are not from famous fashion folk but from a Holocaust survivor, a lawyer and an author. The first person essays are poignant, moving, funny, touching, and thought-provoking. The photo above is from my Instagram, where you can follow along as I post photos of: kids, book covers, the tiled floor at some old restaurant, and other random stuff like the shadow a bike leaves on the sidewalk on a sunny day.